Katie Pertiet here happy to be guest blogging for Molly this week! 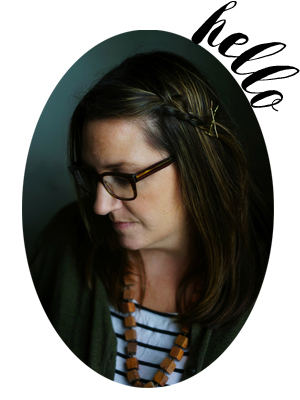 When Molly mentioned taking a break with a possible guest blogger I was happy to hop on and share my passions of digital scrapbooking and photography with you! I've been working as a graphic designer for nearly 25 years now and have been involved with the scrapbooking industry for the past 5 years. I started as a traditional, paper scrapper taking pictures of every outing and event with my daughter as well as all the everyday moments too! But working on my computer everyday led me over to explore digital scrapbooking and it didn't take long before I had shelved my paper supplies, no longer had daily messes to clean up and was completely hooked on digital scrapbooking and opened DesignerDigitals as an outlet to sell my digital scrapbooking products! Now I scrap more than ever before and am on a mission to document not only my daughter's childhood, but also my past and my ancestors. I want to have a record of where we have come form to pass down to future generations and to share with my cousins. Getting started with Digital Scrapbooking is not as intimidating as you may think! We have some great tips to get you started with Digital Scrapbooking, Your First Digital Layout using Photoshop or Elements. I have a $20 gift certificate to DesignerDigitals.com to give away today to help you get started with digital scrapbooking. To be entered in the drawing, leave a comment about how you preserve your families memories! Hi Friends. Just popping in to say be sure to leave any questions you have for Katie about design, digital scrapbooking, photo editing, etc. in the comments and she'll do her best to answer them in her posts this week! And thank you katie for a great giveaway! I'm telling you, all the elements with digital scrapbooking are about as addictive as fabric and yarn shopping! Hi Katie! It’s nice to meet you! I would love to win your gift certificate! I am currently doing only paper scrapping and am looking for a way to do some digital scrapping. Your gift certificate would certainly open that door for me! Looking forward to reading more of your posts this week! Just wanted to take this opportunity to thank you for developing such an extensive site at DD. It’s always interesting to see how with just the right touch or combination of accents a visual story can be enhanced. I’m already a registered customer though, so please — if my name is selected — share the gift certificate with the comment after mine. Hi, Katie! 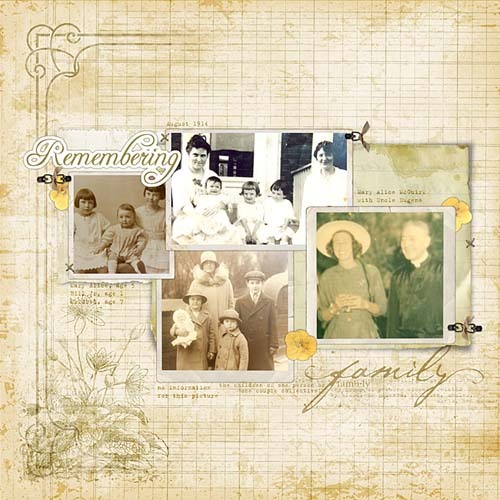 I primarily use Designer Digitals for genealogy scrapbooking and turn the pages over to Shutterfly to produce books. It’s a wonderful way to share the work with others by having extra books made and given as gifts. If you haven’t visited DD before, you have to go over and look at the wonderful choices for family memories scrapbooking–their designers are top notch! P.S. This is an unsolicited comment–I just couldn’t help but brag them up–they’re that good! I am looking forward to your posts on digital scrapbooking and learning more about the craft. I have a number of scrapbook “projects” that I have started, but need to complete (our wedding six years ago, Christmas memories, and my two year old’s first year). I was thinking of preserving some memories by creating books on picaboo and other similar sites. Are these sites considered digital scrapbooking? It seems like the choices might be limited. Boo! I hate to say that I don’t do much! I literally take the pics. of my camera and then burn them onto a CD or DVD (which I haven’t actually been able to get to work) for movies! I am very interested in Digital Scrapbooking though! Great post! Blogging has become my way for keeping memories. I am hoping one day to print it all off for my kids as a book they could even one day show to their kids or grandkids. Katie, I am embarrassed to say that I have boxes and boxes of old photos in my attic. Everytime I look at them, I sigh, and think I would like to scrapbook them. Some day……. I’ve just started digital scrapbooking. Loving it so far, but still learning Elements. Excited to read your posts this week! I’m 95% a paper scrapper, but I have enough digital supplies to open my own store! I guess I’m still a little intimidated even though I’ve very successfully completed a couple of online digi classes. When I sit down to do it on my own, however, paper always seems easier because that’s what I know. I do use some of my digital supplies to create embellishments or add overlays to photos. I never thought I’d really get into scrapbooking, but I started downloading freebies last year and got hooked. I love Winkflash for getting photobooks printed. I am trying to catch up on our family’s memories. Then I plan to make a book of my own life before we were married (yes, I have fewer pictures of my own childhood than either of my son’s first month of life – love the age of digital photography). If I get that far, then it will probably be onto fixing up ancestor photos in Photoshop. I’ve been wanting to start digi scrapping… just have NO idea where or how to start. There’s SOOO much out there, I’m a little overwhelmed. Currently, our memories are stored in memory. Hi and thanks for the giveaway! I have been wanting to try digital scrapbooking for a while and can’t wait to learn some pointers. Blogging is one way I keep up with our family’s memories and I have started covering our front entry wall with black and white pictures of babies and kids from multiple generations of our family. My children and guests are always intrigued to learn who the adorable babies are and how we’re related.Thanks again! Hello there :)I am the family keeper of all of our older family photos. At the moment they are all in albums but I would love to do something more creative with them! Before my dad passed away, I asked him to write on the back of old family photos – some from the 20’s – so that I would have some idea of who was who. Now I wish I had video taped him telling me his stories. He’s only been gone five years and already I’m forgetting. I think that was one of the reasons I started blogging, so my thoughts might be preserved for my boys. i have been keeping a blog. it seems to be the easiest route for keeping up with family & updating my photos, milestones, & memories. it seems to be working well. I have tried to start paper scrapbooking a little but have so many boxes of photos I have mostly just gotten overwhelmed and stopped. I would love to learn about digital scrapbooking as I am much handier at a computer than with a scissors but don’t really know where to start. Katie – I’m a big fan of your lovely creations. I was absolutely delighted to see you guest blogging here. Thanks for taking the time to share your tips with us! Hi Katie!You’re everywhere lately! I’m already a fan of Designer Digitals and a member there. I haven’t begun to try any heritage scrapping, so I can’t answer your question, i just wanted to say hello! i had never really thought about digital scrapbooking before, but i know my daughter would love it! looking forward to reading more. I love the IDEA of DD, I just don’t have any knowledge to start. Going to check out the tips for beginners at DD. Thanks for mentioning it. Preserve family memories…we have a big Rubbermaid tub in my mom’s attic. Does that count? Actually, this is a project we’ve all been thinking about tackling for some time now. This digital thing might be a good way to go! I’m lucky to have an aunt on each side of the family tree who’s into ancestry, so they’ve preserved all of the old photos and I can pick and choose which ones are the most meaningful to me for my scrapbooking. I haven’t done much of that kind of scrapbooking, though…mostly spending my time on my own family right now! Unfortunately not very well. All my photos are on my computer or CDs. Both of which would be gone if we had a fire. GASP…. anywho…. would love to win this certificate!! I bought the software but haven’t done much with it…. need to get crackin! I am not too familiar w/ digital scrapbooking other than SmileBox. I need to super easy, already put together stuff. I will check out your links.